The only one of it’s kind… The G2 (yeah, ok, I am including the first model G1 here too!) is a one of a kind goody. The G2 is a rangefinder. You can read more about rangefinders here. Being a rangefinder, it is compact without compromising the quality of the images. Unlike Leicas, Voigtlanders etc it has no focus patch in the viewfinder. The G2 autofocuses using some serious gadgety systems – a focus infrared light supported with a passive system. Don’t ask me to explain it any further than that… Way too techy for me. All you need to know is that the autofocus is pretty quick and precise. There is a school of thought on the interwebs that the G2 is a bit slow on the focus – I have never missed a shot waiting for the focus, but it can occasionally “hunt” a little bit. The first generation G1 body apparently was quite slow to focus, but I have never had the chance to try one out. Continuous (CAF) : works pretty well on slow moving targets like pedestrians but is nowhere near what you get on a modern DSLR body. If you are in continuous mode, the camera will refocus automatically as the camera moves. You can depress a second button that is part of the focus mode select to over-ride the refocus in continuous mode, but I just find it one thing too many to think about when out shooting. Single (SAF) : the lens focuses once and will keep the focus as long as you keep the shutter button depressed – this is the mode to be in for simple recomposing. 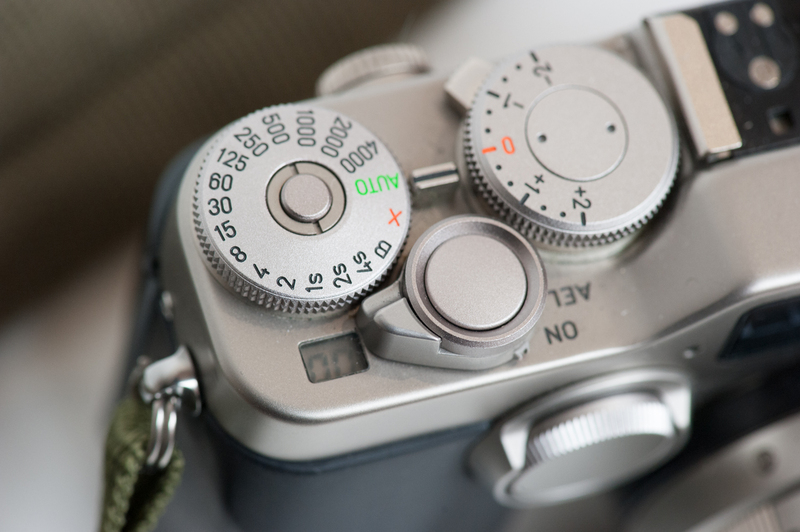 Manual (MF) : bizarre system utilising a dial on the front of the camera and led indicators in the viewfinder. Don’t bother. If you want to zone focus or use hyperfocal distance then just get a Leica or Voigtlander body. 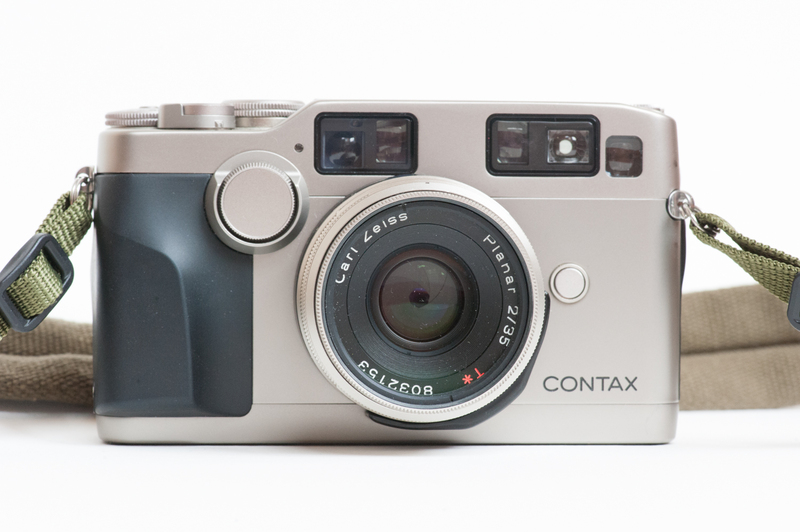 The Contax G2 is all about autofocus – I am at a loss as to why the designers thought it would be a good idea to add the bits and pieces to be able to manual focus this camera? Yeah, on the front of the camera! One of the things I love about using a traditional manual focus rangefinder is setting up for zone focus or hyperfocal distance. If you get it right, you just virtually point and shoot. The downside is having to use higher aperture settings to maximise the zone in focus, often f8 or f11 – meaning you need some decent light to get the shot. 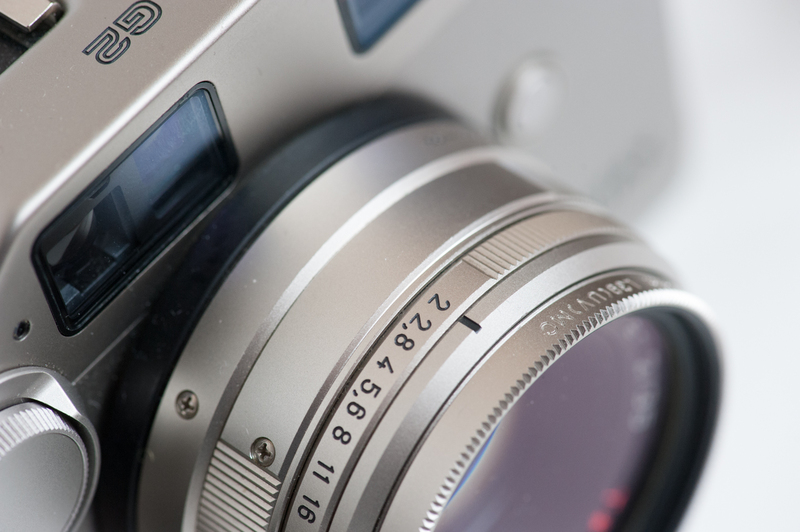 The G2 has a superb range of Zeiss lenses that mostly have f2 or f2.8 as a maximum aperture. In lower light conditions, the autofocus combines with the large apertures to enable fast shutter speeds for sharper results. I find that manual focus rangefinders can be a bit of a struggle in low light conditions – it takes a couple of seconds to manually focus which can cost you a passing opportunity at times. There was a Contax G1 body also manufactured prior to the G2. This body has a reputation for hunting when on autofocus and very slow. I am unable to comment, as I have never used one. I find the G2’s autofocusing perfect for lower light daylight conditions. 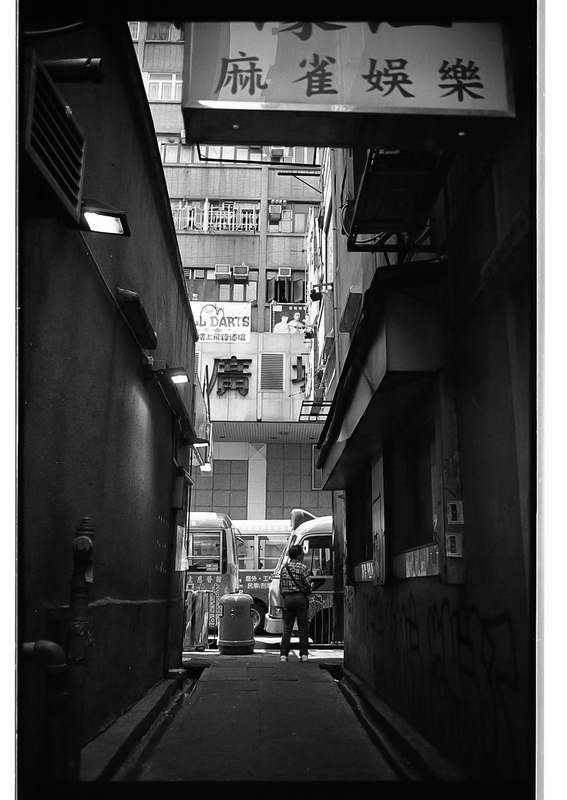 Wandering deep into the light challenged Hong Kong’s back alleys and laneways, the G2 delivered great results. Setting the lens to f2 and being confident of the results enabled me to concentrate on the images, and not my settings. Unique again. 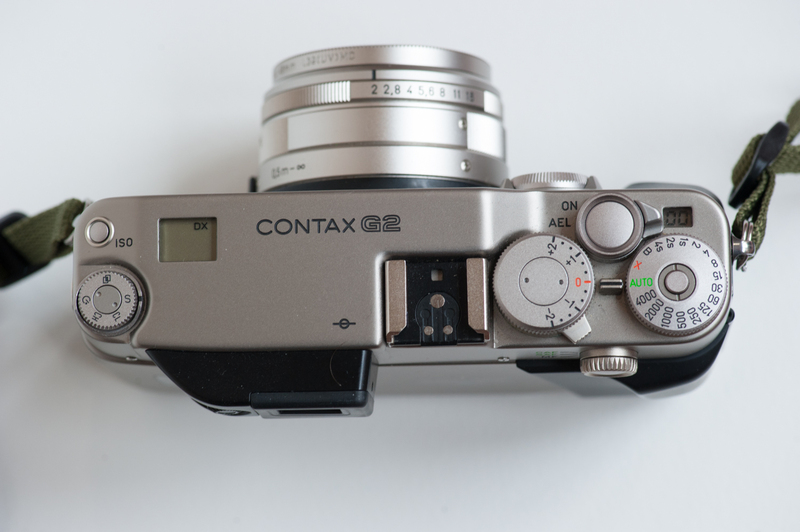 Contax made the G2 very different to a Leica. When you lock in a lens, the viewfinder optically zooms to the correct view rather than bringing up framelines. So whatever you see in the viewfinder is pretty much what is going to end up on the film. I probably still like a traditional viewfinder with framelines, as you can see what is happening just outside of the frame. As a result of having an optical zoom, the G2 is the only rangefinder I am aware of that can effectively use a zoom lens. There is a 35-70mm zoom lens in the range – as you zoom the lens, the optics in the viewfinder zoom to match. The viewfinder is fairly good, although it can be a little darkish compared to a Leica. It is set in a raised block on the rear of the body which helps to avoid smooshing your nose too much against the body. There is a diopter adjuster for those who need it. The bright LED indicators in viewfinder contribute to the darkish feel of the viewfinder, but the indicators are easily read. All metal, all glass, all Zeiss! I have used the 28, 35, 45, and 90mm. My favourite is probably the 35mm, more due to the focal length than anything else. The 90mm is a great lens for getting people’s faces and expressions. There is a fair bit of discussion on the interwebs about which lens is the best, but frankly, I can’t pull them apart on quality. If you are buying one, just make sure it hasn’t been converted to use on a mirrorless camera, which is not uncommon. The G2 has a self timer and a continuous shoot mode. It also has the standard stuff like film ISO override. The best mode I find to shoot in is “auto” which is aperture priority. There is no shutter priority mode. The only issue with “auto” is that the aperture setting is not visible in the viewfinder. You just have to be mindful of where you are at on the aperture ring and use the shutter speed indicator as a guide as to the aperture. 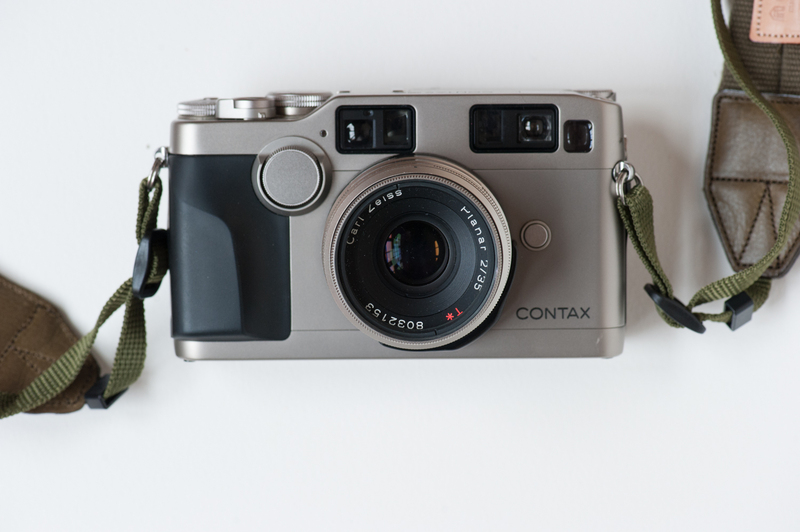 The Contax is a solid hunk of metal. Everything is manufactured to be great. Every dial and switch is metally goodness. The G2 came in a champagne kind of colour, and a limited edition black. Both models had matching lenses. The black G2s are usually priced at quite a premium, but do look pretty cool. The G2 feels perfect in your hands. It is compact and discreet, but feels completely bullet proof. The shutter button has a precise feel about it, and all the controls click into place reassuringly. For some reason, the G2 has an LCD indicator on the top of the body for the shot counter instead of a mechanical one. Over the years, many of the LCDs have bled, not affecting the usability of the camera, just the aesthetics. This is a quality camera, built to be loved over a long lifetime. The downside? Everything is motorised or electric. Everything from the winder to the focus are motorised. One day, those motors are going to wear out and are no longer being manufactured… Leaving you with some beautiful but completely useless lenses. At this point, the lenses are probably still valuable as potential conversions to mirrorless cameras. If you love this camera, I would recommend buying a second, less minty body that you can afford and keep it as a spare. There are still plenty of G2s on the market, so I suspect getting a replacement body will not be an issue for quite a few years. Overall, the G2 with any of the lenses is a great buy for street photography. Compact and bullet proof. 1. Size matters. The Contax G2 is compact and about the same size as a decent point and shoot, but will deliver images of SLR quality. 2. Size matters part two. 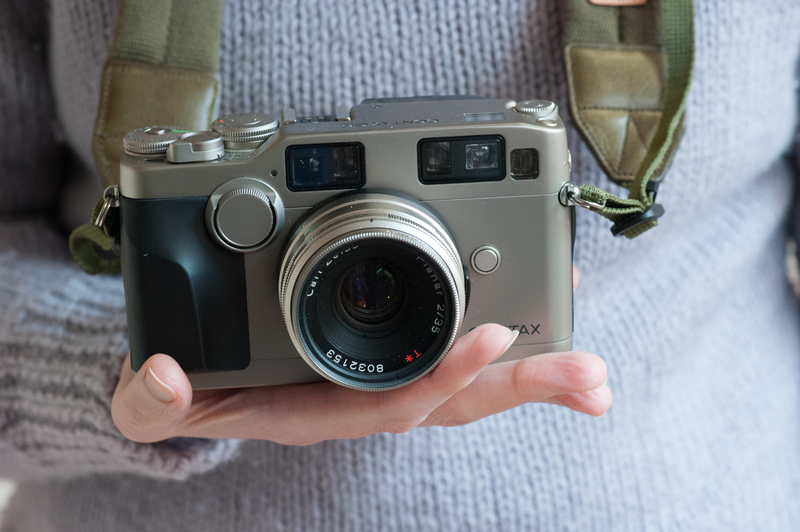 The compact nature of any rangefinder doesn’t freak anyone out on the street. People tend not to fret when you point it at them. 4. Build quality part two. They just don’t seem to make cameras like this any more. Maybe Leica still do? The heft in your hand just makes you want to take it out and take some pictures. The design is perfectly balanced and is aesthetically wonderful. People love using beautiful things. Steve Jobs sums it up for me. 5. Autofocus. Being able to set the lens to f2 and then rely on the autofocus unlike all other rangefinders is a real positive. Low light specialist! 6. Lenses. Zeiss. Listening to the camera nerds, apparently these lenses are pretty darn good! 7. There is a little TLA 200 flash unit that goes with the G2 and works perfectly for low light street. 1. Everything is motorised. Whilst I am sure all the moving parts are pretty tight, every motor is something that is eventually going to break down… And Contax no longer make spares. They don’t even really exist anymore! 2. The champagne colour is quite unobtrusive, but not quite as stylish as the black bodies and lenses. The black units come at a serious price premium though. Not really worth it. Buy the champagne! 3. Ye olden thymes autofocus. Yes, it works pretty well, but is still not as quick as a brand new Nikon D something or other. 4. Led film counter – most bodies will already have a leaking led screen. Doesn’t affect the camera much, but is just a bit ugly. 5. There is always the question of investing in 35mm format cameras vs medium format. The closest thing to this camera in medium format would be either a Mamiya 7 rangefinder, or the Contax 645 autofocus, depending on what is more important to you. 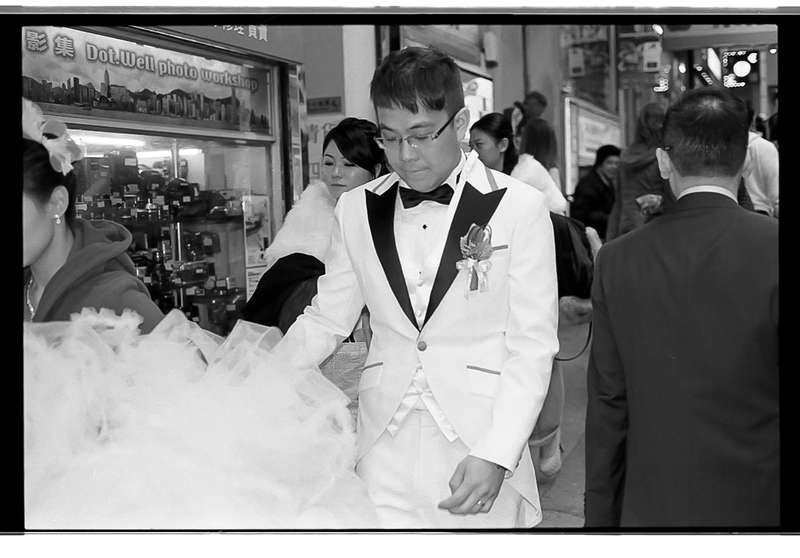 The Mamiya is more discreet, but the Contax has autofocus. You will have to make the call on this yourself! 6. Centre point for autofocus. When ya gotta be quick, sometimes only having the one focus point right in the centre of the frame can be a bit frustrating! 7. No useable manual focus. None. Nada. Don’t even think you are going to be able to decipher this stuff. I would definitely want to put a roll of film through the G2 if possible prior to buying. Listen to the motor film winder, and the focusing motor. If you can find one that looks pretty minty, it is probably worth taking a punt on eBay regardless. The G2 was the kind of camera a lot of people with lots of money purchased and then didn’t use too often. So look for a minty one. Is there bleeding in the LED film counter screen. Not that it matters, but if you are going to part with some cash, you want to know! Are all the dials firm and click into place nicely? I received one poorly described body where the focus dial was very loose and did not stay in the mode selected. Is the viewfinder housing fixed and firm. Again, this can be a problem where the housings can come a bit loose. Are there any whines or unusual sounds when the film runs through? And as with any rangefinder, make sure the windows are all clean and clear. When buying, I found that a lens / body combo often offers the best value – particularly if you can get one with a more unusual 35mm or 28mm lens. The 45mm lenses, whilst awesome, are fairly common and can be picked up under the odds on their own without a body. A lot of sale lots come with multiple lenses. If you can pick one up with a 28, 45, and 90mm lenses with a G2 body and you can afford it, I would go for it. The 35mm lens usually comes at a premium. If I had to pick one lens, it would be the 35mm. If you are on a budget, get the 45mm. It is the most common and offers best value for money. I have not used the 21 or 16mm lenses. I have used the zoom in a shop, but just find zoom lenses too distracting. Pick up the little TLA200 flash – it is a fantastic unit for both street photography and just taking party snaps! It is compact and completely inconspicuous. As mentioned, the G1 has a reputation as a fussy focuser. I would steer clear of the G1, but I haven’t used one… so, if you are hard up, maybe you could give it a go. They are a lot cheaper than the G2 bodies. A lot of the G2 bodies also have a data back. Don’t get one. Complete waste of space, considering the camera never knows what aperture you are shooting at. It is just a dead weight added to the camera. This is a great write up! I do have a question for you regarding focus. I have a G2 and, though I love it, I have missed quite a few shots due to back focusing or simply missing altogether and getting a soft image. Any tips you can share for managing the camera’s unique focusing system? Hmmm, interesting question. I know that I am just careful – I always make sure I line up focus using the centre spot, then reframe accordingly. There is not magic bullet on this one, and it is probably fair to say I don’t really discuss this in the review. I have another camera with similar centre focus and have just learned to live with it… Sorry I cannot help more Nelson! Haha, great. Fast reply, cheers.